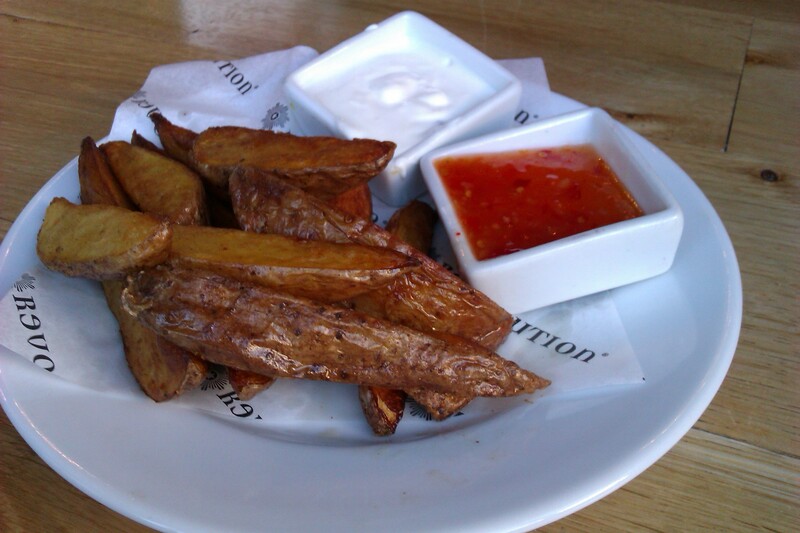 The chunky potato wedges arrived with the skins on, just the way we like them, but the accompanying sour cream dip was strangely runny and tasteless – disappointing. Thankfully, Revolution redeemed themselves with the sweet chilli dip, which had a fierce kick. As a spice fan, I scrubbed the sweet chilli bowl clean, but if you can’t take the heat you might find the sweet chilli dip a painful ordeal. Appetites duly piqued, we wasted no time ordering our mains, which arrived in double-quick time. 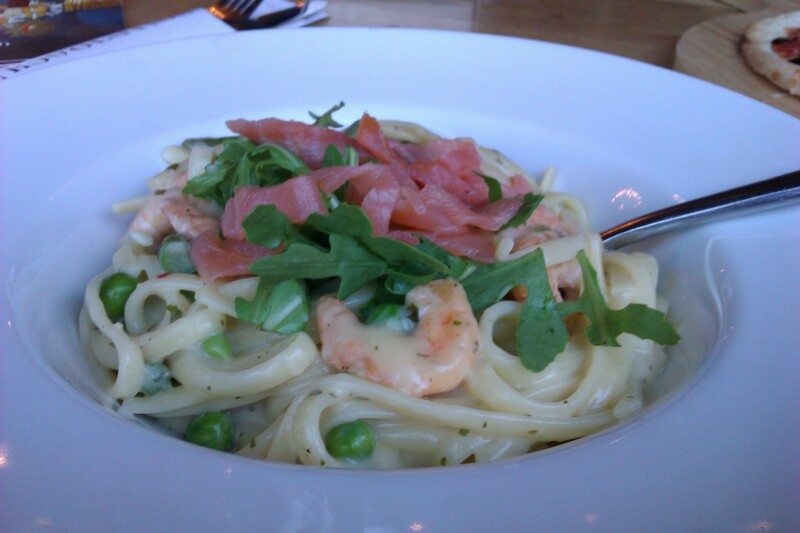 My Salmon and King Prawn Linguine (£8.95) looked promising, as I was presented with a bowl full of linguine and creamy sauce, topped with a generous portion of smoked salmon. The white sauce was refreshingly light without skimping on taste and, mixed up with a forkful of linguine and assorted veg (firm asparagus, fiery rocket and peas to be precise) it was delicious. The smoked salmon was the highlight for me, delivering a hit of seriously strong, salty deliciousness, but I was disappointed by how overcooked the king prawns were. On the whole, a flavour-packed dish of perfectly-cooked veggies, a light but tasty sauce, and plenty of seafood, although at £8.95 Revolution are definitely being cheeky with their prices. To put it into perspective, my linguine was roughly the same price as a vegetarian pasta dish or Spaghetti Ragu at Strada. Since we were in a vodka bar, we just had to sample Revolution’s special vodka glaze, and ordered the intriguing Revolution Vodka Pizza (£7.95). 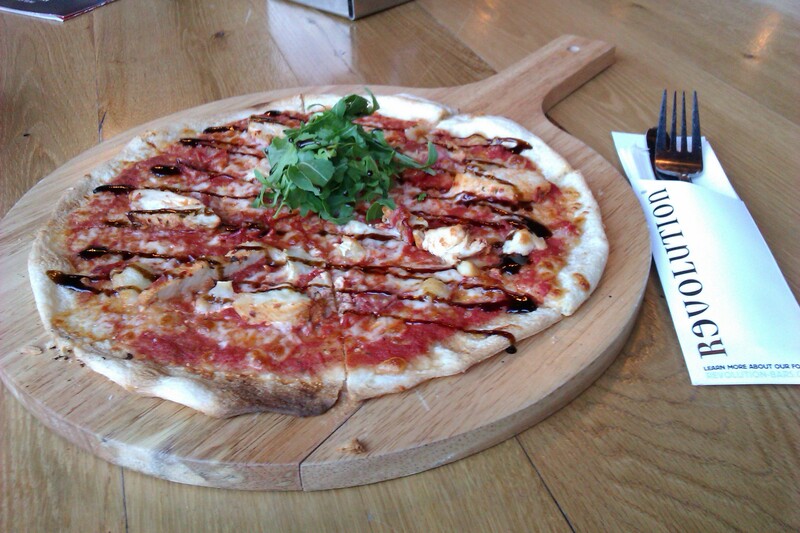 This thin and crispy pizza wasn’t mean with the toppings: chorizo, goat’s cheese and mozzarella with sweet chilli peppers, fresh rocket and the aforementioned vodka-glazed chicken, finished off with a drizzle of tart balsamic vinegar. Thin pizzas are easy to overcook, but the Revolution staff avoided this pitfall and sent out a perfect thin and crispy pizza. The vinegar drizzle in particular was a clever touch, giving the pizza extra bite. Which brings us neatly onto the bill, and our major issue with Revolution – the price. Not only is the food expensive, but the steep booze prices bump up the bill even further. Even if you stick to pints all night, expect to feel the pinch. The surroundings are top-notch and the food is tasty with a few quirky options on the menu and quality ingredients used throughout, but there’s no escaping the fact that Revolution feels like the sort of place you’d pop into for a bite to eat on a whim, rather than somewhere you’d book in advance and look forward to – and the prices don’t reflect that. Good food, modern surroundings, but ultimately, the cheque was a bit of a stinger! I haven’t been to Revolution in a while now but I totally agree with your review. I enjoyed what I had there but for what it is, they’re definitely over-priced. The food’s really good and I like the venue, but definitely, it is WAY too expensive for what you get. With drinks, the bill was about what I’d pay for an evening out in a restaurant!